Eshi-Zhalsan Dorzhiev has a VK-photo-album including BUK launchers and many photos geotagged near Kuybyshevo, south of Marinovka. His album clarifies the situation with these BUKs a bit more. This of interest because BUKs at that location could have communicated with the BUK south of Snizhne that shot down MH17. Eshi's entire album is saved, since in general when such things get publicity, they are removed in a couple of days. The first photo appears on Jan 11th 2014 with Eshi driving a truck. It means the photo was uploaded on this date. It must have been taken on or before this date. But we don't know how long before these upload-dates a photo was taken. 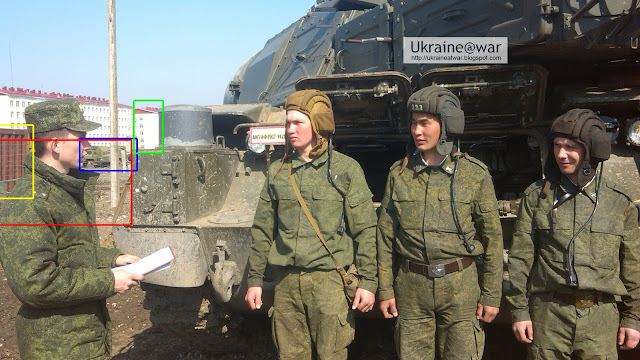 On Eshi's hat it says 222, obviously the number of the BUK he is operating. So nr 233-loader (or TEL) and 23x launcher (or TELAR) are in Vladikavkaz too. The soldiers on the photo are photographed on their back, walking towards the plane. So they are entering the plane for departure and not arriving here. The photo could not be geolocated on any airfield nearby Vladikavkaz though. Most likely it was an earlier photo when Eshi's group departed to go to Vladikavkaz. These photos must have been taken anywhere after the previous upload and this date. So between July 6th and August 1st. MH17 was taken down on July 17th. So the question is: was he already there on the 17th? Not likely did he do another journey by train a week later. This must be a photo from the same trip. It means he has arrived on the BUK position south of Marinovka. Very likely he was NOT on this location before his previous upload date of August 1st. But it can not completely be ruled out, since he might have had some intensive introduction time at the location before having time to chill out and make photos. Many more photos are there with exactly the same location. The red arrows indicate the border of this sand. This all means the geotagging was correct and the photos where indeed taken at this location. Indeed Google Earth shows several tracks in and out of the trees along the treeline here. They had installed a wooden frame next to it, to have some shelter. Another view at the dinner-area, with the barbecue on the front, the wooden frame and table on the background and a line of mugs for brushing teeth probably. This is not a typical BUK antenna. So it might be possible that this is for communicating with other units and HQ? He must be on his way back again. And he left anywhere between Sept 23rd and Oct 16th. He uploaded the photo on the 18th and the previous upload was on the 16th, so he must have traveled by train on Oct 17th. Also tracks leading to/from the camp area can be seen. On the Sept 4th image even a truck can be seen (inset) within the red square. The total area of operation for the BUKs is much larger than this camp though. After these 2014 photos Eshi does not upload anything military anymore and before this album he did not have anything military either. He has been uploading these photos from January to October 2014, a period of ten months. He typically is a conscript doing his one-year-time and he has been trained to work an a BUK. He travelled by train to Rostov-on-Don anywhere between July 6th and August 1st. He probably arrived at the Kuybyshevo BUK position anywhere between August 1st and August 6th. But it can not completely be ruled out that he might have already been there two weeks earlier. He most likely has traveled back from Rostov-on-Don to Vladikavkaz by train on October 17th. It means he was 2,5 to 3 months at the Kuybyshevo BUK location. At this point we can unfortunately not be conclusive about whether Eshi was at this location on July 17th or not. 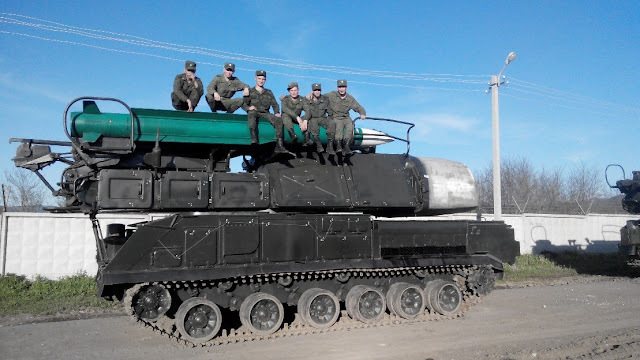 According to the Bellingcat report MH17 – Potential Suspects and Witnesses from the 53rd Anti-Aircraft Missile Brigade BUK 222 was replaced by BUK 3x2 that had downed MH17. UPDATE: it turns out different brigades can have the same numbers, so the argument about #222 is obsolete. By now it is deleted from the album, but it was in an album with a geotagged photo near the Kuybyshevo BUK position. See this article. It was impossible to geolocate it anywhere in that area though. But... the BUK has no numbers and had a fresh paint job. Typically something the Russians were doing with anything approaching and/or entering Ukraine. So it is very well possible that this particular BUK had indeed been transported to Kuybyshevo. And that THAT was the reason the owner had geotagged it at that location. 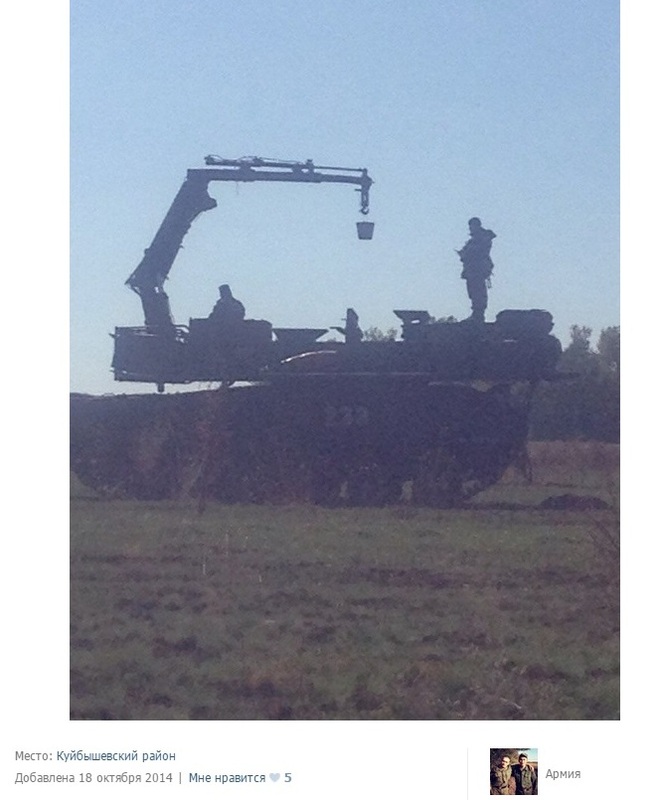 That one typically looks like a camouflaged BUK as we have seen in Eshi's photos. And therefore this one DOES seem to have been taken near Kuybyshevo. So far I have never seen this on any other BUK. It's an(other) indication that the BUKs near Kuybyshevo indeed came from the Vladikavkaz base. Note that the environment EXACTLY fits the Kuybyshevo-position, e.g. tree line, high yellow-brown corn, grass. And that one is a loader indeed. The BUKs near Kuybyshevo must have come from Vladikavkaz. Exactly when they arrived there, is still unclear. More satellite images might give answer to that question, since the oldest 2014-image in Google Earth at this moment from that region is from Sept 4th 2014. This doesn't rule out the possibility that prior to the 67th arriving at Kuybyshevo (if that was after the July 17th) a BUK radar from the 53th had been driven to Kuybyshevo to connect with nr 3x2. Note that the photos are taken on April 2nd 2014 and the satellite image is taken on April 10th. This is a confirmation that the BUKs near Kuybyshevo came from Vladikavkaz. IF YOU HAVE OR KNOW ANY OTHER INFORMATION PLEASE LET ME KNOW.